Access Israel strives to make Israel a place where people with various disabilities are integrated into society with dignity, respect, equal rights and maximum independence. 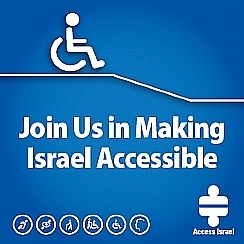 Since its establishment, Access Israel has revolutionized the quality of life and accessibility for hundreds of thousands of people with disabilities and elderly in Israel, and has become a leading organization worldwide and a model for making businesses, governmental, academic and non-profit organizations fully accessible. These achievements result from a wide range of innovative projects, ongoing awareness activities and improvement of business models aimed at making Israel an accessible place. Over 1.6 million people with disabilities live in Israel today (18% of the population). About 700,000 of them deal with severe disabilities whether from birth or inflicted by car / work accidents, illness, old age, or wars / terrorism. They all suffer from physical, sensory, cognitive disabilities. The lack of accessibility prevents them from leading a normal life, causing them and their families' great suffering. Therefore, Access Israel makes it an issue to act in all sectors of life, in all geographical areas in Israel with an emphasis on the periphery to make Israel more accessible and inclusive for 100% of its population (and possible guests from abroad). Over the years, the organization has succeeded in promoting the topic of accessibility and giving a voice to the disabled population. Promoting legislation, raising awareness, unique accessibility consulting methods, web portal, complaint center, accessibility training, accessibility in education, accessible culture, tourism and more. We are now aiming to enable the future digital era, making sure it's accessible and usable day one for people with disabilities and the elderly. Access Israel also aims to share its experience and knowledge regarding accessibility so that countries from all over the world can learn and implement. Accessibility and integration of people with disabilities in Israel have come a long way since Access Israel was founded, but there is still much to do. We invite you to become our partner and help us make Israel the most accessible country in the world.